Astronauts aboard the ISS recently captured a rather revealing night image of East Asia. Though the dark patch at center looks like water, it's actually North Korea — a country of 25 million people sandwiched between China and South Korea. This picture pretty much says it all, the stark legacy of the Kim Dynasty. Its capital city, Pyongyang, appears like a small island, despite a population of 3.26 million (as of 2008). 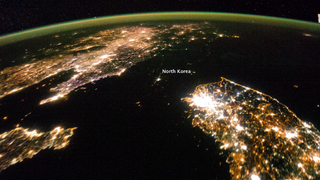 The light emission from Pyongyang is equivalent to the smaller towns in South Korea. Coastlines are often very apparent in night imagery, as shown by South Korea's eastern shoreline. But the coast of North Korea is difficult to detect. These differences are illustrated in per capita power consumption in the two countries, with South Korea at 10,162 kilowatt hours and North Korea at 739 kilowatt hours.